It’s all happening in Broadway these days. Right next to Sydney’s CBD we have stylish shopping, entertaining theatre and multicultural restaurants to choose from. All of this provides lots to enjoy whilst you are out and about. But it’s hard to enjoy any of these facilities, if you’re not feeling safe in your home or business. Let’s change that with your Broadway locksmith. At Fusion Locksmiths we can assess your current locks, electronic security, and recommend a safer more manageable system, so all your valuables will be secure. We can help with home and business security, working out a financially sensible solution so not just your family and employees are safe but also your possessions. New to Broadway? Need a Locksmith Who Provides No-Obligation Quotes? Have you just moved into the area? Not sure how many people have lived in your house or have a copy of your key? 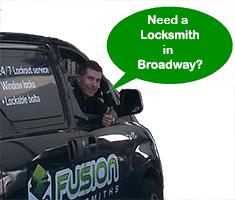 It’s time to call Fusion Locksmiths. We can change your locks with a simple lock rekey or if you want to increase your security, change to new modern locks. We can also assess your security around your new house, to double check that you and your family will be safe and secure. Call us now to speak directly with a locksmith. We can guide you through your options over the phone, so you know exactly the kind of solutions that will fit your lifestyle and home. Rest easy with Fusion Locksmiths!